Many of us dream of one day owning our home. We may purchase an existing home, select a new home in a development or build a new home. Direct from the Designers understands that building a new home is a big project, but when done correctly can be one of the most exciting and rewarding accomplishments during your quest for home ownership. We have assembled into ten steps the home building process, starting with creating a home budget to moving in, so you’ll know what to expect during each stage. Before you purchase a house plan you need to develop an accurate home building budget that not only takes into consideration your finances but priorities, needs and future goals. It’s essential that your know how much it will cost to build your new home, as well operational costs once it’s built. A mortgage calculator can help you make an accurate estimate of what your monthly payments will be and how much you should finance. Once you have a solid estimate, you can begin shopping around for the best loan options. Make sure that you prequalify for a construction and mortgage loan well in advance of purchasing your land and house plans so if you have any credit issues or outstanding debts, you have enough time to resolve them. Before you start looking for a house plan you should put together a list of essential features you want and need, like a one-story or two-story design, square footage, amount of bedrooms and bathrooms and garage size. Your personal style and taste will influence your preference for the interior layout. Do you want an open floor plan? Do you want flexible/bonus spaces? Do you need a large gourmet kitchen or pampering master suite? It’s easy to find a house plan once you have your search criteria ready and a collection of over 6,000 best-selling house plans from Direct from the Designers to choose from. If you are looking to build a green home, you’ll want to check out our exclusive collection of ENERGY STAR® approved house plans. The foundation of your home is a critical element in the building process because it is what holds the entire structure. It must be done correctly to prevent future problems that can affect your home’s safety and efficiency. After the ground is excavated, forms will be built with framing lumber (you can clean and reuse for framing), and then the concrete will be poured into each section. You’ll need to decide what type of foundation you want — basement, slab or crawlspace. After the foundation has set (approximately a week) and the form boards are removed the framing of the home begins, and you will start to see the layout of your new home take shape. 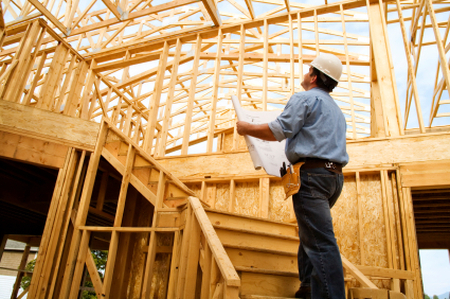 Once the framing is complete, an inspector will review the plumbing, electrical and framework, as well as any other required inspections. After your new home passes inspection you will be allowed to have your first official walkthrough (or pre-drywall walkthrough) where you will see the layout of all your rooms, staircases and placement of outlets. Make sure that if you requested certain outlets be added or moved that they are done now before the sheetrock is added. Your builder will now begin to enclose your home with drywall and a protective weather barrier (best known as house wrap) to protect your home from unwanted moisture. The roofing system and windows and doors will be installed at this stage. This is an exciting phase because each room is now defined. Be sure each room is exactly the way you want it to be before the insulation and mechanical installation is added. Remember to ask lots of questions; you aren’t expected to understand every aspect of the building process. For more information on weather barriers visit Dupont™ Tyvek®. It may not be the most exciting product you pick out for your new home, but it is one of the most important because it is responsible for keeping your home cool in the summer and warm in the winter. By selecting the right R-value for each key area of your home — attic, floors and walls, basement/crawlspaces and ducts — you will be creating a comfortable indoor environment while saving on yearly energy costs. Worth checking out is the Owens Corning® EnergyComplete™ Whole Home Insulation System from the company that pioneered pink insulation. Now your exterior (stone, stucco, brick, vinyl siding, red cedar, polymer shakes and shingles) and millwork will be installed along with any additional exterior features like porches, columns, and railings. Ply Gem® offers all the products you need to create a stunning, high-quality exterior, including vinyl siding, polymer shakes and shingles, fiberglass windows, stone veneer, fences and rails and gutters. At this stage of construction, all your mechanical equipment will be installed including HVAC, plumbing and electrical. Now it’s time to cover your walls and ceilings with drywall, which is commonly called wallboard, plasterboard or sheetrock. Drywall has become the standard finishing product for new home construction (as opposed to plastering) because it is easy to install and relatively inexpensive. Your builder will help you decide the thickness of drywall you will need based on you local building requirements, but the standard is ½ inch thick. Once your wall and ceilings are covered, you can start to get creative with your wall coverings and millwork. One of the most exciting stages of your new home construction is when you get to design and select all the products that will go into each room. This includes flooring, cabinets, countertops, appliances, lighting fixtures, millwork and trim, interior doors, plumbing products and much more. You should have a list of all the products you need and want and then do some research about the pros and cons of each product, read reviews and consumer reports and shop for the best prices before you commit to a particular brand and model. This is one stage that you want to monitor carefully to ensure the interior design of your home turns out exactly the way you want. The final walk-through is the last critical step before you can move into your new home. This is when you make sure that everything was done correctly and that everything works. Don’t let your builder rush you! Turn on all your appliances, lights, HVAC system, faucets, and showers. Flush toilets. Check to see that all your cabinets, doors and windows open and close properly. Also, make sure there aren’t any major defects like cracks, scratches and gaps in the floors. If there are any issues, make sure your builder fixes them before your closing. NOW you can line up the moving company and get ready to enjoy your new home!! Home Building Costs Increase Helping You Understand Mould During Home Building The Cost of Home Building – Dreaming of Building a New Home, but Worried About the Expense? Who is Who in Ontario Home Building? i m looking to build house of 2200 sq ft. in Inisfil area. please respond with ur budget and expense. About $500,000 – give or take $50,000 depending on finishes. Building a new home is indeed a challenging one since you’ll be surprised of how laborous and expensive it can be. Thanks for posting this article. Every step is spot on and I believe that hiring the best home builder will be a good investment if first time to build a home since they will be there all througout the building process. I am interested to build a new home of about 3300 square feet. How much can be the cost in total. Also how much it takes just to make the exterior. let me know please. This is not the question that can be answered. If you are looking for an average Ontario price these days, then $300.00 per sq.ft. Unfortunately, we do not build in that area.